The U.S. Department of Energy and General Motors have teamed up to bring North American students the EcoCAR 3 competition, a challenge which will give student engineers the opportunity to help design and build an innovative, advanced vehicle which will reduce emissions, protect the environment and save citizens money at the pump. 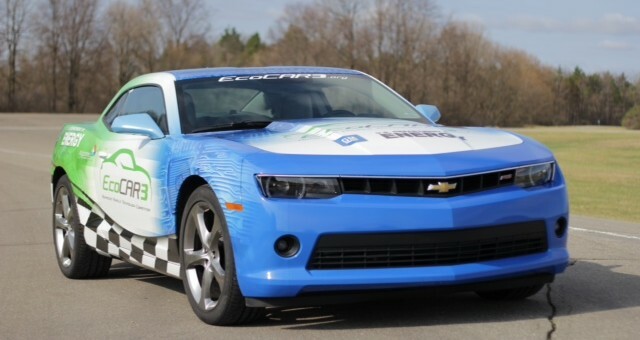 The official vehicle for EcoCar 3, a Chevrolet Camaro, was announced at a launch event last night. All 16 universities will receive their own Camaro from GM to work on and make more efficient. The main focus of students will be to reduce the vehicle’s energy consumption, reduce greenhouse gas emissions and reduce tailpipe emissions while considering cost and maintaining the car’s performance, utility and safety. To achieve their goals, students will integrate alternative energy powertrains, improve aerodynamics and use alternative fuels. The car must retain its standard body design and appear outwardly unaltered in order for the team to win. They have four years to reach their targets, with the competition commencing this year and lasting until 2018. Universities will need to recruit a team spanning many engineering disciplines including mechanical, electrical, computer and software engineering, as well as communications, marketing, and project management. This mimics how a real-world automotive industry environment operates and gives students skills and assets which will help prepare them for their careers. “Through this competition, North American students gain valuable real-life experience that they can use to bring the auto industry into the cleaner energy future,” said U.S. Energy Secretary Ernest Moniz. More information on EcoCar 3 and a full list of participating schools is available on the competition’s website. Lastly, while a 2014 Camaro RS V6 is pictured above, the decision on just which model year Camaro is still being made. Maybe these student can do what GM hasn’t done: convert the ICE Camaro to a EREV version.